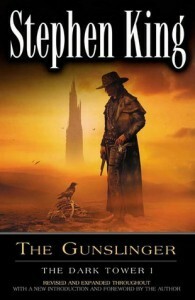 The Gunslinger A.K.A Roland of Gilead is the story of the gunslinger and his quest to catch the man in black. The story takes place in an alternate universe type of place that is somewhat like the American Old West. Do not read below if you don't want this twisting tale ruined for you!!! As Roland travels across the desert with his mule in search of the man in black, he encounters Brown, who kindly offers to allow him space to sleep for the evening. At this time Roland has a flashback of time spent in Tull. Tull was a small town which Roland came to not too long before the start of the novel. The man in black had passed through the town previously; he brought a dead man back to life, and left a trap for Roland: the town itself. After Roland spends some time there, the leader of the local church reveals to him that the man in black has impregnated her, and has turned her against Roland. She turns the entire town on Roland; men, women, and children. In order to escape with his life, Roland is forced to kill every resident of the town, including his lover, Allie. Telling this story seems cathartic for Roland. 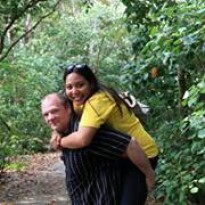 When he awakes the next day, his mule is dead, forcing him to proceed on foot. Before Roland leaves, Brown asks his permission to eat the mule. At the way station Roland meets Jake Chambers, who died in his own universe when he was pushed in front of a car while walking to school in Manhattan. Roland is almost dead when he makes it to the way station, and Jake brings him water and jerky while he is recovering. Jake does not know how long he has been at the way station, nor does he know exactly how he got there. He hid when the man in black passed by the way station. Roland hypnotizes him to determine the details of his death, but makes him forget before he awakes (since Jake's death was extremely violent and painful). Before they leave the way station they encounter a demon in the cellar while looking for food. After their encounter , Roland snatches a jawbone from the skeleton in the hole, from which the demon speaks. After leaving the way station, Jake and Roland eventually make their way out of the desert into more welcoming lands. Roland rescues Jake from an encounter with a succubus who is an oracle, and then couples with the oracle himself in order to learn more about his fate and path to the Dark Tower. Roland gives Jake the jawbone from the way station to focus on while he is gone. After Roland returns, Jake discards the jawbone. As Jake and Roland make their way closer to the mountain, Jake begins to fear what will become of him. Jake and Roland make their way into winding tunnels below a mountain, the move along by an old mine cart. During the journey, they are attacked by the "Slow Mutants", monstrous subterranean creatures. Roland fights the Slow Mutants off and they proceed. Eventually they find the Man in Black, and as Jake dangles precariously from the tracks, Roland comes to a pivotal choice; save Jake or pursue the Man in Black. Roland chooses to follow the Man in Black. Jake tells Roland, whilst hanging: "Go then. There are other worlds than these." He lets go of the edge and falls without screaming. After sacrificing Jake in the mountain, Roland makes his way down to speak to the man in black. The man in black reads Roland's fate from a pack of cards, including "the sailor" (Jake), "the prisoner" (Eddie Dean) "the lady of shadows" (Odetta Holmes), "death" (but not for Roland), and the Tower itself, as the center of everything. The man in black states that he is merely a pawn of Roland's true enemy, the one who now controls the Dark Tower itself. The man in black creates a representation of the universe, attempting to frighten Roland by showing him how truly insignificant he is in the grand scheme of things, and asks him to give up his quest. Roland refuses, and is made to fall asleep by the man in black. When he wakes up, ten years have passed and there is a skeleton next to him — what he assumes to be the man in black. Roland then sits on the edge of the Western Sea, contemplating the three people he now is charged with bringing into All-World - the Prisoner, the Lady of Shadows, and the Pusher.